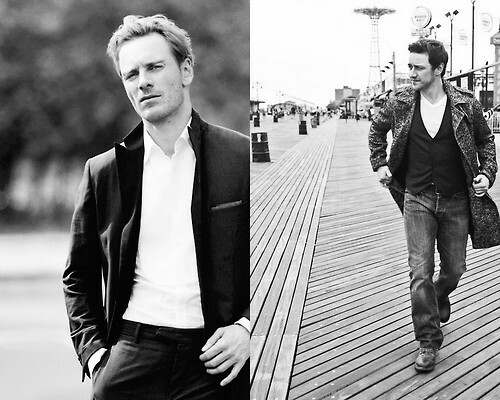 McFassy ♥. . Wallpaper and background images in the James McAvoy and Michael Fassbender club tagged: james mcavoy michael fassbender mcfassy. This James McAvoy and Michael Fassbender photo contains बिजनेस सूट, सड़क, शहर के दृश्य, शहरी सेटिंग, शहर दृश्य, and शहरी की स्थापना. There might also be राह-चलता, कैरिजवे, carriageway, व्यापार जिले, शहर, व्यापार जिला, डाउनटाउन, अच्छी तरह से तैयार व्यक्ति, सूट, पैंट सूट, pantsuit, पैंट्सट, and अच्छी तरह से कपड़े पहने व्यक्ति.